The New "Battery of Asia?" 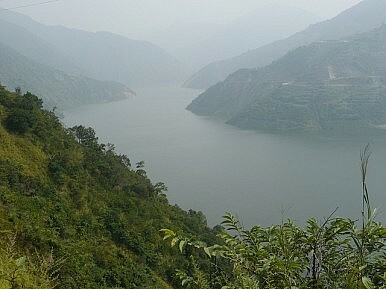 Laos intends to build more than 70 dams along tributaries of the Mekong River. While there are rich profits to be made, is the cost too high? International concerns about Lao’s plans to massively dam the Mekong River and its tributaries have again been brushed aside by the authorities in Vientiane who have announced new contracts worth about $1.0 billion to build three dams. The dams will feed a hydropower plant on two tributaries of the Se Kong River, just 100 kilometers from Laos’ southern border with Cambodia. The Se Kong flows into the Mekong from the Bolaven Plateau which then feeds into the Lower Mekong Delta. The Xe-Namnoy will be constructed by South Korean firm SK Engineering & Construction and will be aimed at producing 400 megawatts of electricity from water flowing from a height of 630 meters. According to media reports, SK Construction expects to earn about U.S.$30 million a year from fees while the South Korean state-run firm Korean Western Power will operate the dam until 2045. After that control will be handed over to Laos. More importantly, conservationists now say that Laos intends to build more than 70 dams along tributaries of the Mekong River, significantly higher than previously thought. Plans for a possible 11 dams have long been known, but International Rivers says that of the 70 dams, eight were currently under construction on the Xe Kaman and Xe Kong rivers, another 15 are intended for the Sekong River basin and a further seven on the Nam Ou River. Laos is enjoying a purple patch. The upcoming Asia-Europe Meeting (ASEM) will be the most important diplomatic event in Laos since the communist takeover in 1975. It is also on the verge of joining the World Trade Organization (WTO). Massive rail, road and airport projects are also in the works. And authorities are convinced the tiny landlocked country will get rich quick by turning itself into the “battery of Asia” using its steep mountains and caverns and the abundant rivers that flow through them to feed hydropower plants which will produce enough electricity to allow Laos to export it to its neighbors. However, independent reports on food security have been consistent. One prepared by the International Center for Environmental Management for the Mekong River Commission (MRC) found that 11 dams could cut fish resources by more than 40 percent. The impact of 70 dams on the 60 million people who depend upon the Mekong for their livelihoods is impossible to measure at this stage and getting straight answers out of any of the countries involved has proven almost impossible. Donors have dropped their funding, forcing a radical restructuring.